I wish I was a mermaid. I love everything about mermaids. When I was a little girl my favorite movie was "The Little Mermaid." I watched it so many times, my mother thought she'd go insane. When I found out I was having a little sister, I wanted to name her Ariel. My love for mermaids has definitely stuck with me over the years. I'm not the kind of person who loves something and then obsessively collects everything that has to do with that thing, but I do get excited when I see my likes. I don't have a lot of mermaid merchandise or anything like that, but when doodling or writing, mermaids are a consistent topic of interest that I often revisit. 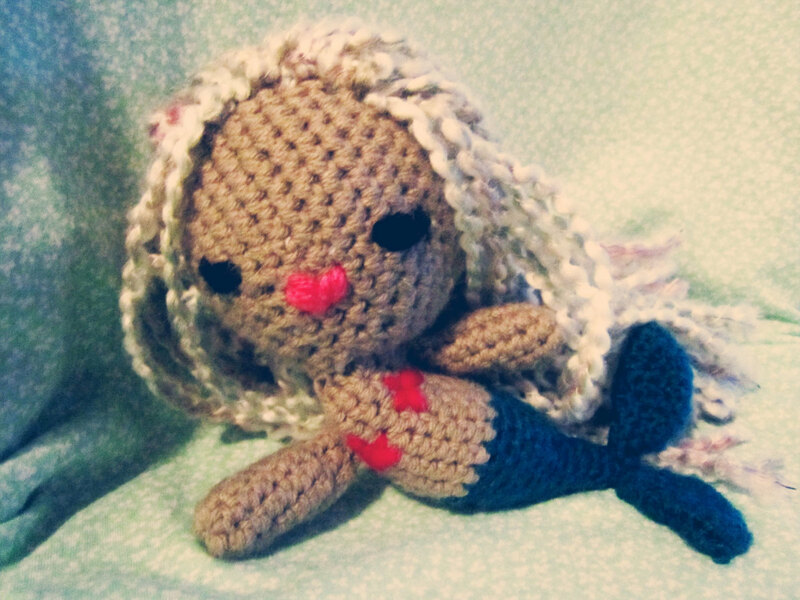 That's how I crocheted my first mermaid. 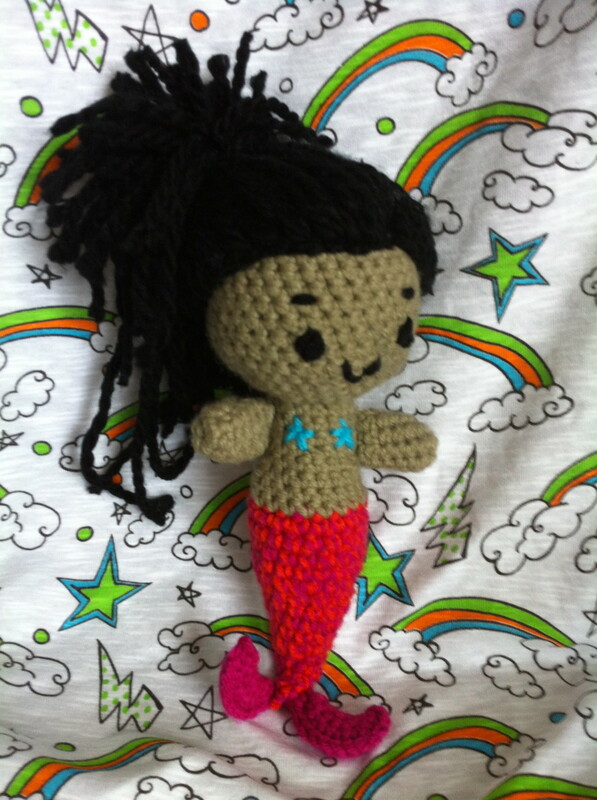 I was commissioned to make a doll for a little girl, but there were no specifications or details except for that it needed to colours purple and green. The first thing that came to my mind of course was a mermaid with purple hair and a green tail. 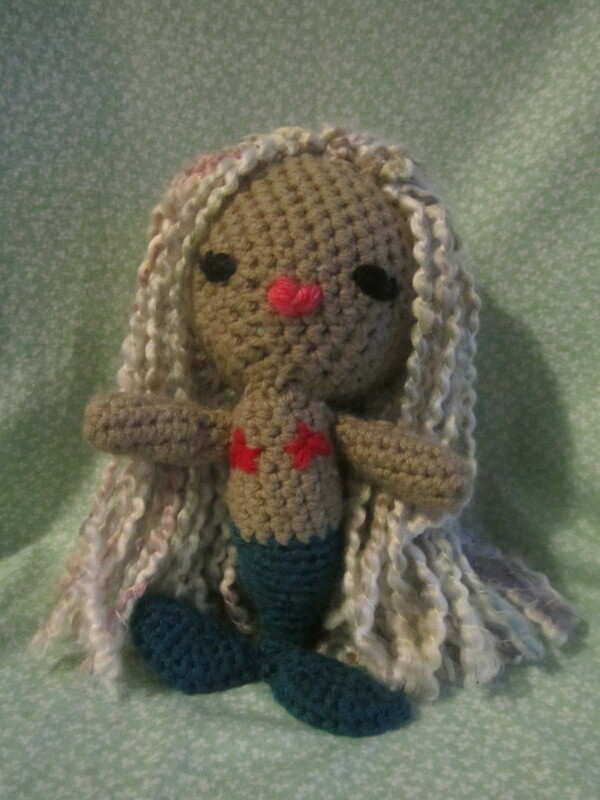 So I freehand crocheted my first mermaid. Some time later I joined the Art Riot and needed to make merchandise to sell. The only thing I really wanted to make was more mermaids, except this time I adjusted the design a bit to suit my style more. 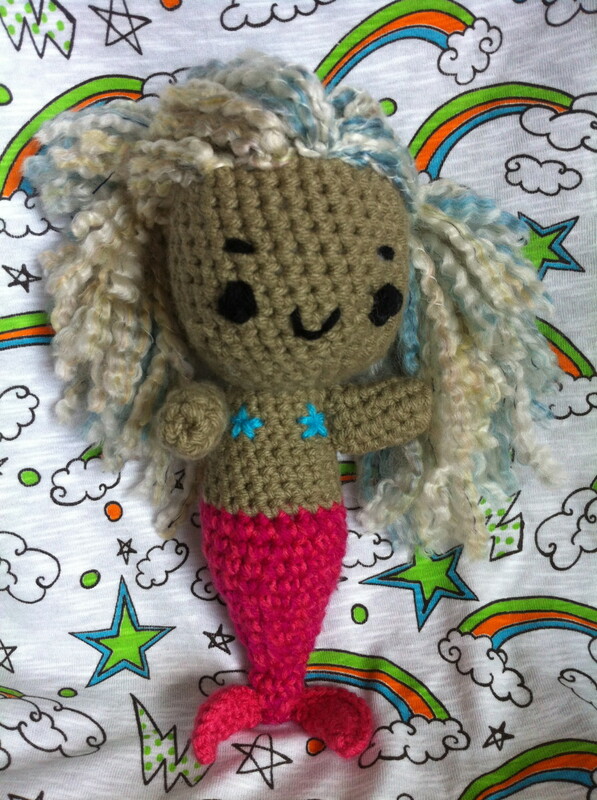 Now I have a great design to use for my mermaids, but I have never written down a pattern! 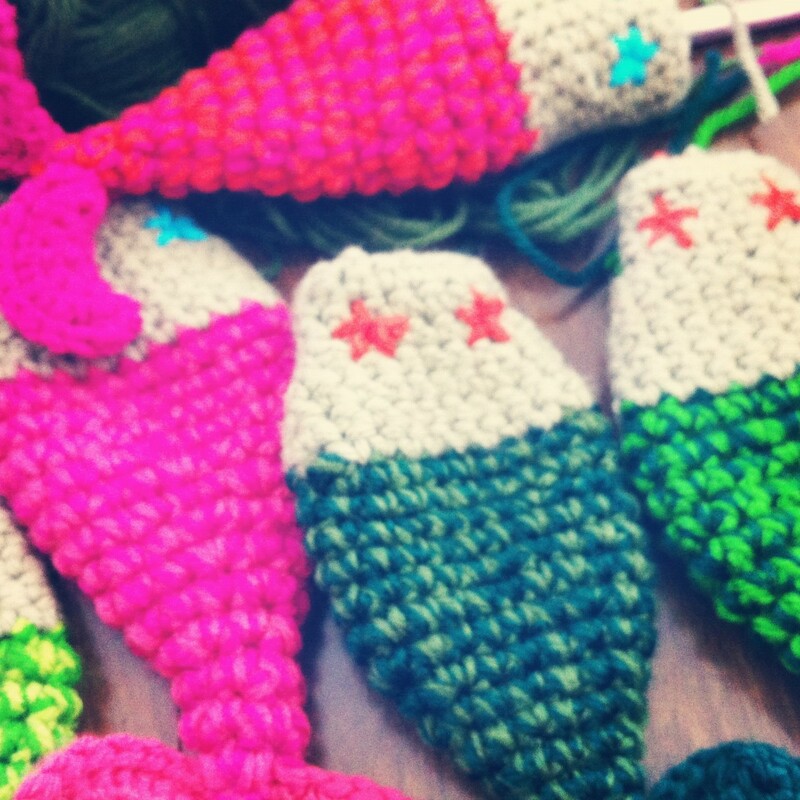 While I love freehand crocheting, I know that having a set mermaid pattern will help me keep things nice and consistent. So I have written this pattern and am very happy to share it with all of you. 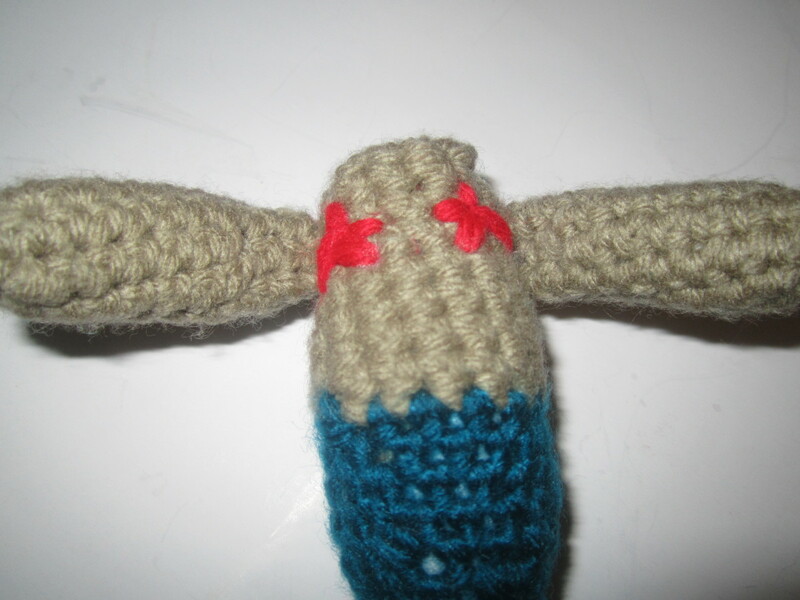 This pattern covers the head, body, and tail, but then just offers tips on the face and adding hair since I think that's where you can really get creative and make this doll your own. I hope you enjoy this pattern and tutorial! If you have any questions or would like to share your work please let me know in the comments. 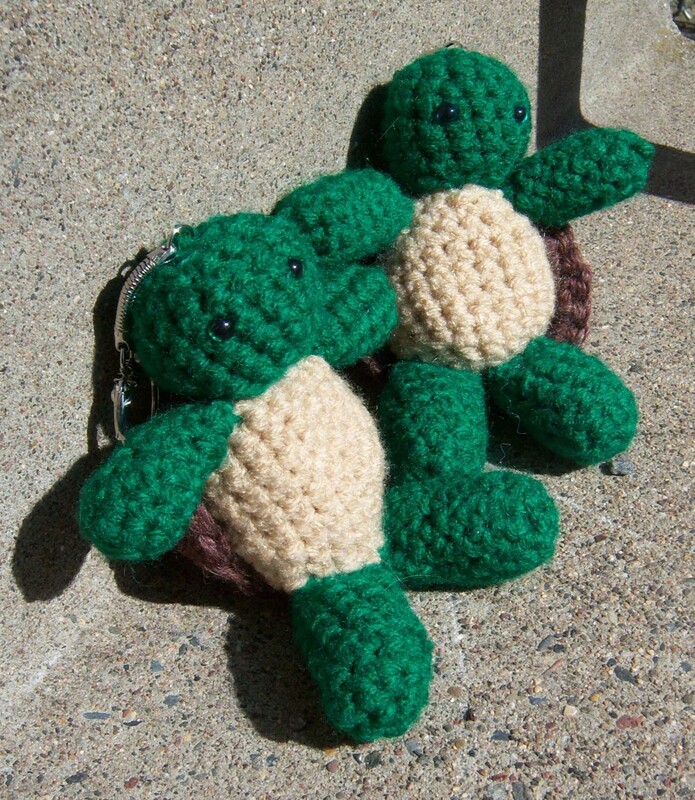 I'm also up for pattern requests for anything crocheted so don't be shy to ask! 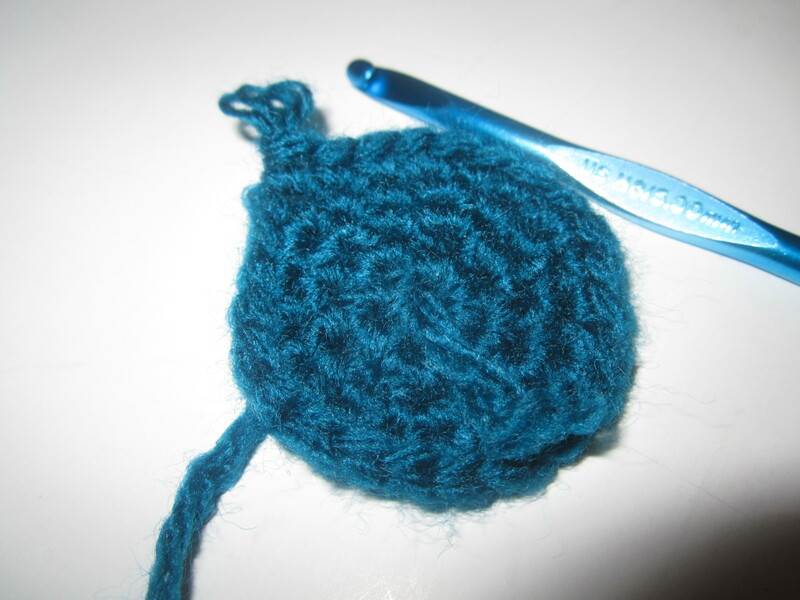 Medium Weight Yarn - You'll need a colour for the skin and tail. 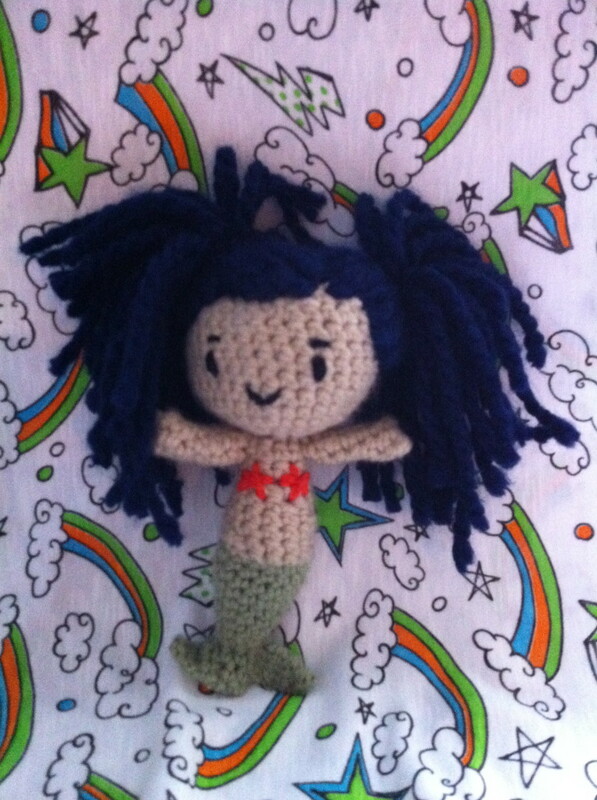 You could also use the same kind of yarn for the hair, starfish bra, and to embroider details if you like. 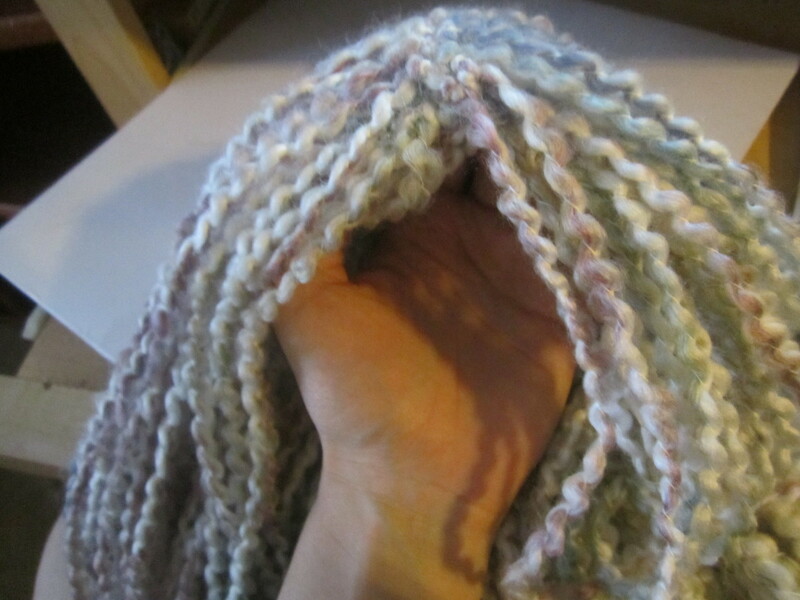 (optional) Mohair Yarn or some special yarn for hair. (optional) Embroidery Thread - for details/features. 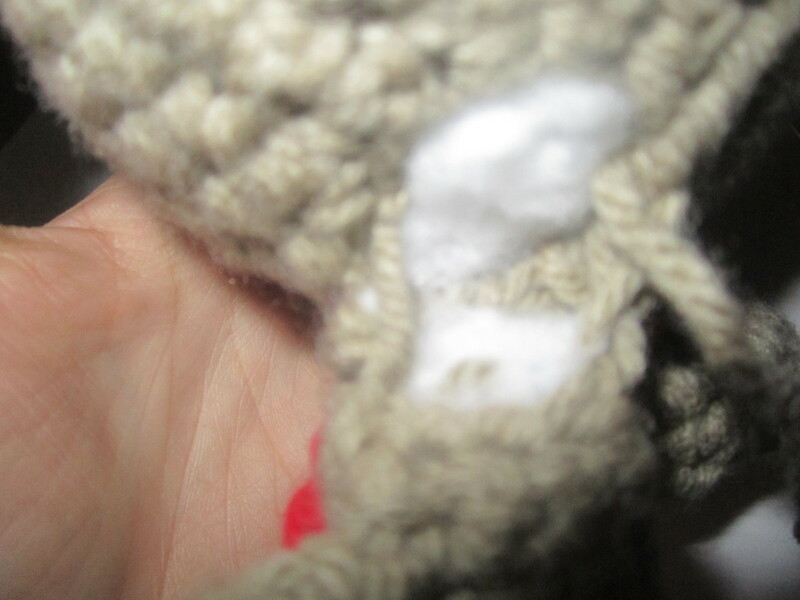 Anything else you'd like to embellish your piece, like doll eyes. 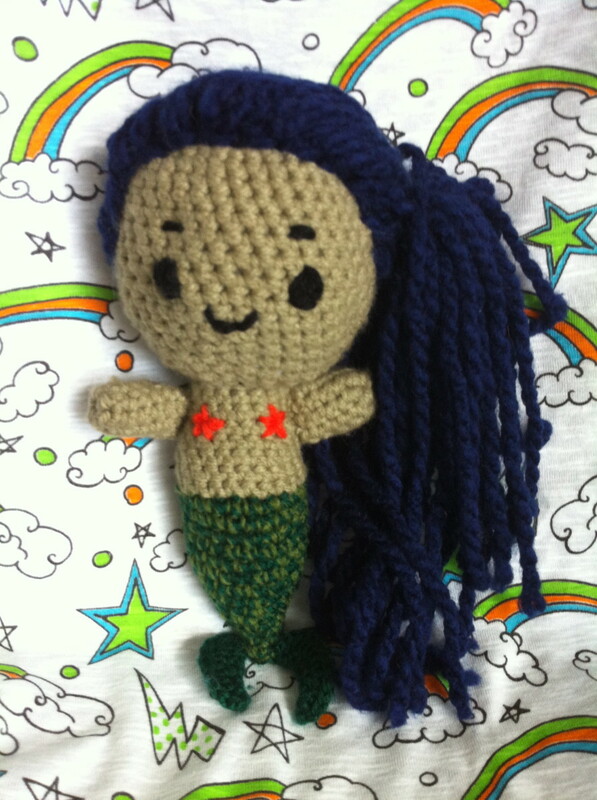 If you are going to use doll eyes, or any other features that clip on, for your mermaid, don't forget to add them before you stuff your head and sew it on the body! *1. Ch 2 or make a magic ring if you prefer. 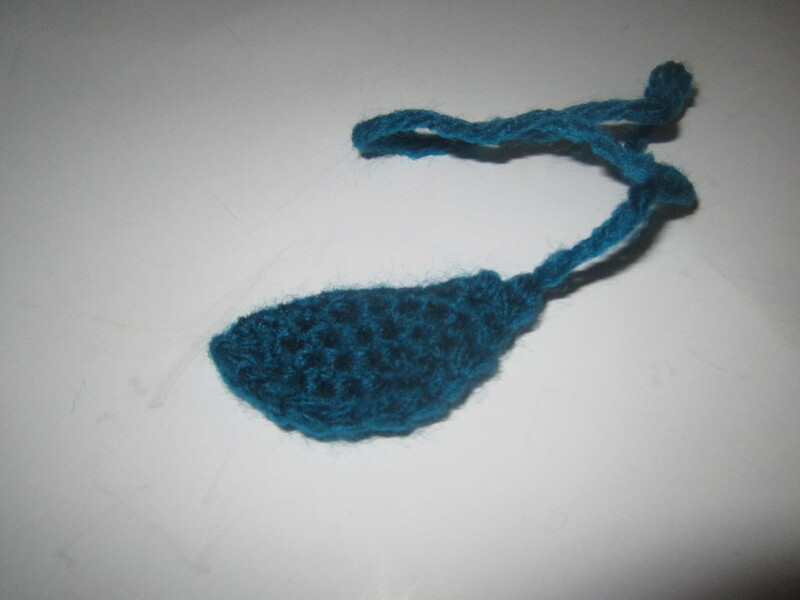 You can make a bandeau top for your mermaid instead of a starfish bra by changing colours while working on the body. Pull in tail and stuff, may be easier to make starfish bra before stuffing entirely. Fin before folding and stitching. Fin after folding and stitching. 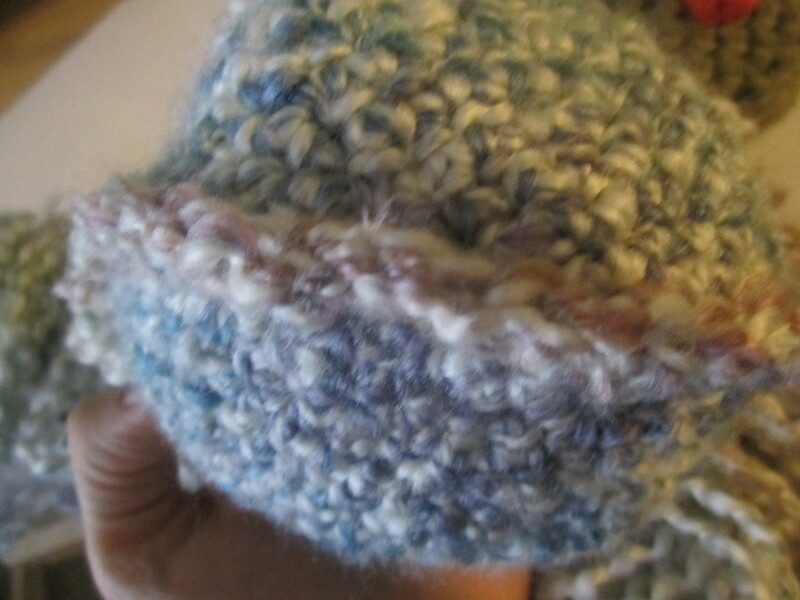 Ch 12 and slip stitch to connect. Switch to fin colour. 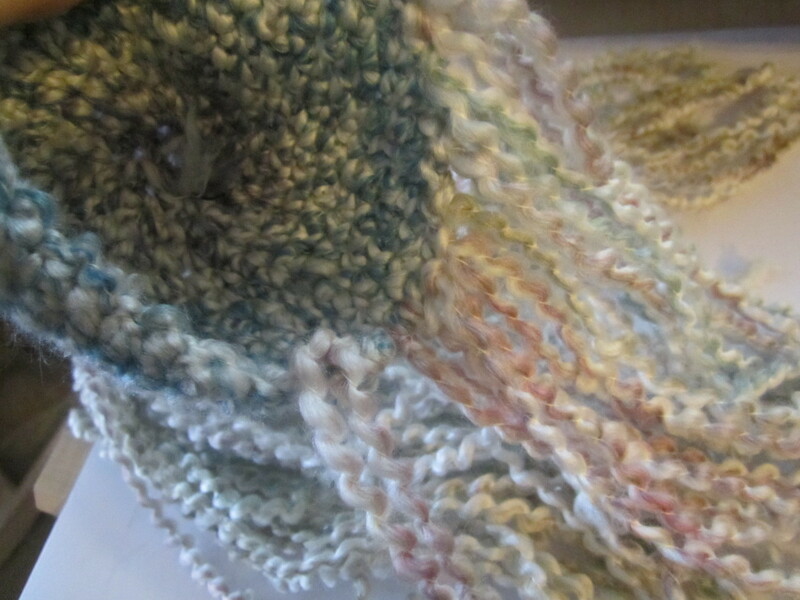 I sometimes use two different coloured yarns together to give it more of a scaly look, but this time I just used one. 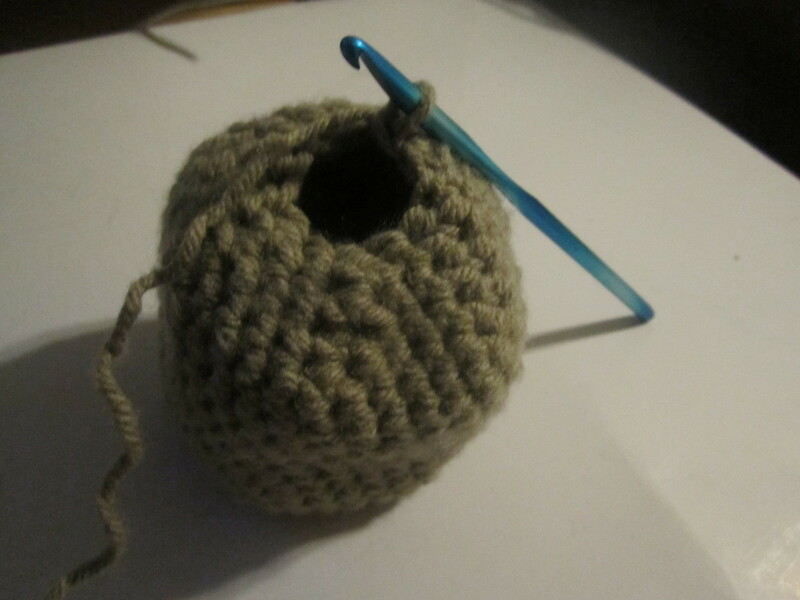 *Pull tail end of yarn into body with crochet hook. 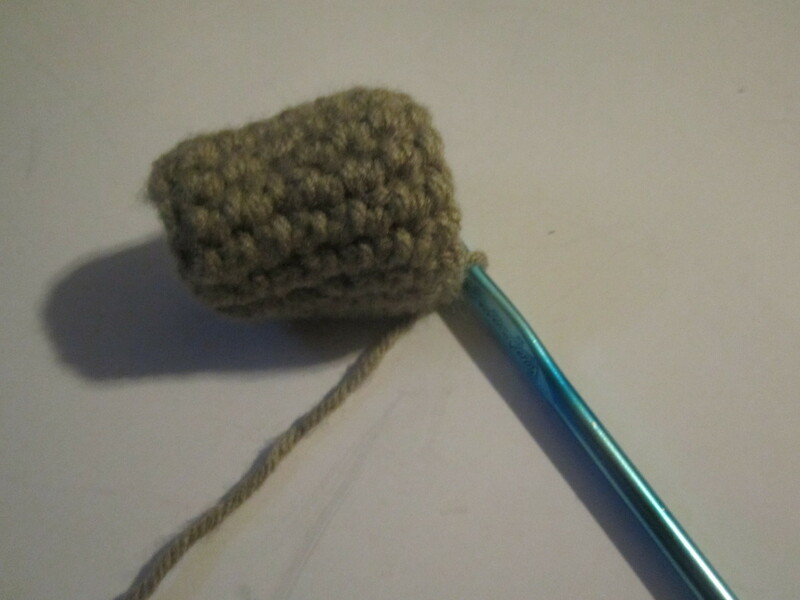 Add stuffing, use crochet hook to help stuff it in there. 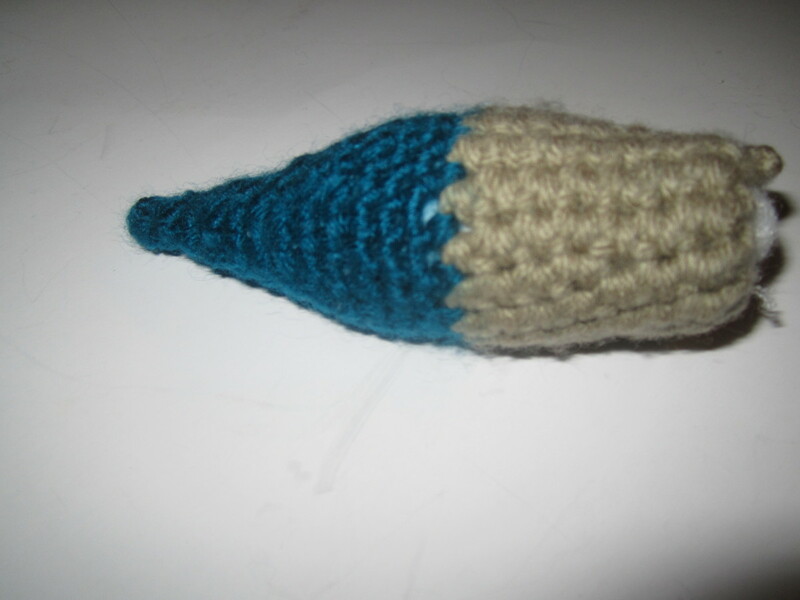 *When sewing on fins (refer below for pattern), thread yarn to other side of one of the fins so that the stitches are facing the same direction after you sew the fins on. 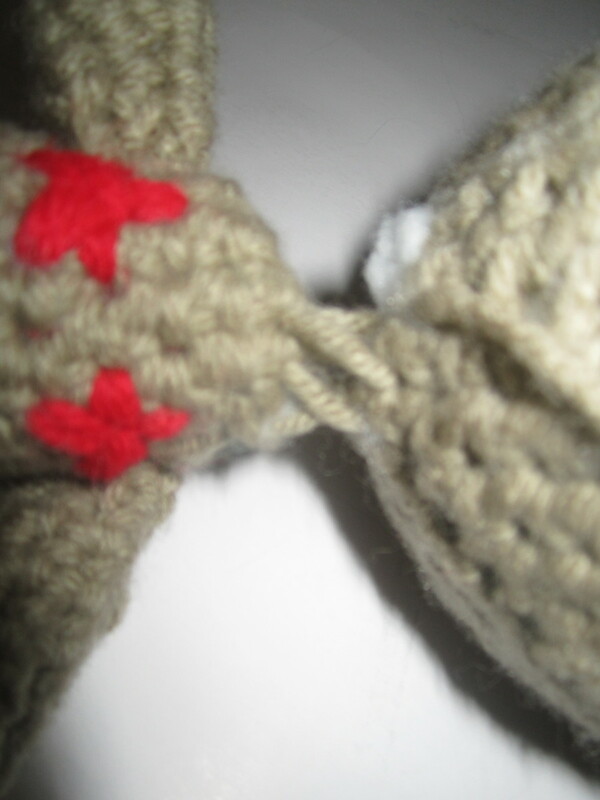 After you've sewn the fins on, add the starfish bra (refer to pictures below if you need help). 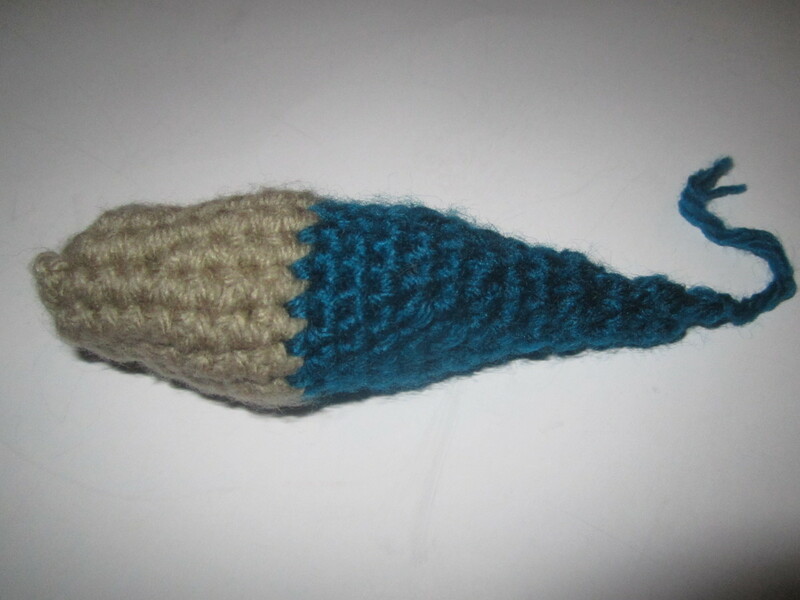 I often make the fins a lighter colour than the tail, but this time I made it all the same colour. 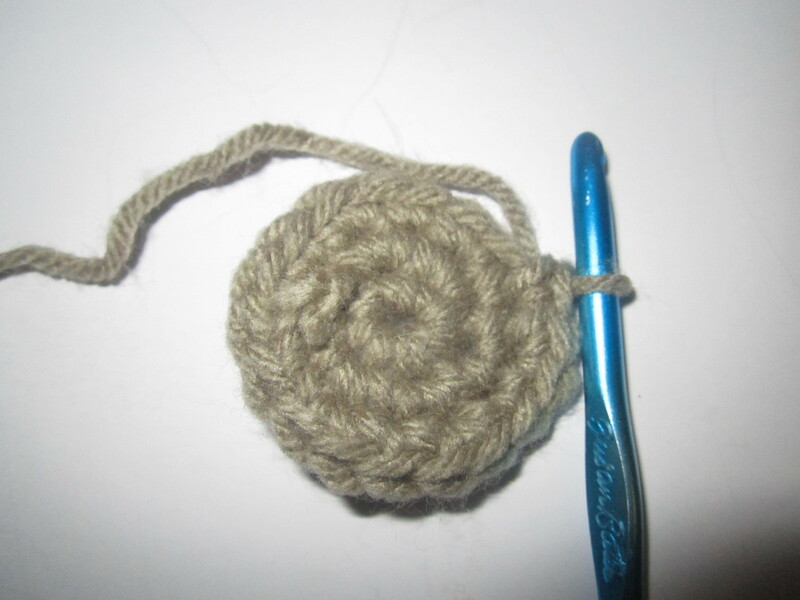 *Fold circle over and single stitched closed. 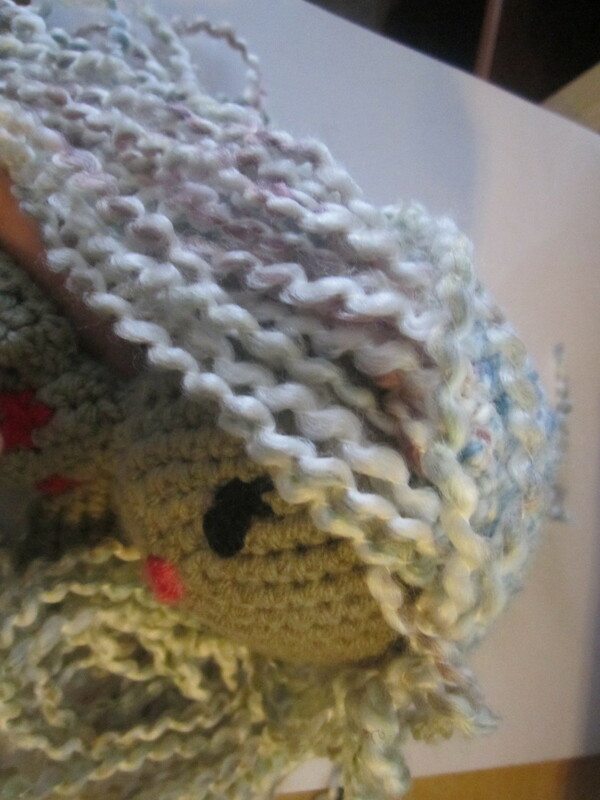 Fasten off and cut long enough tail to sew fin on to mermaid. Amigurumi arms waiting to belong. 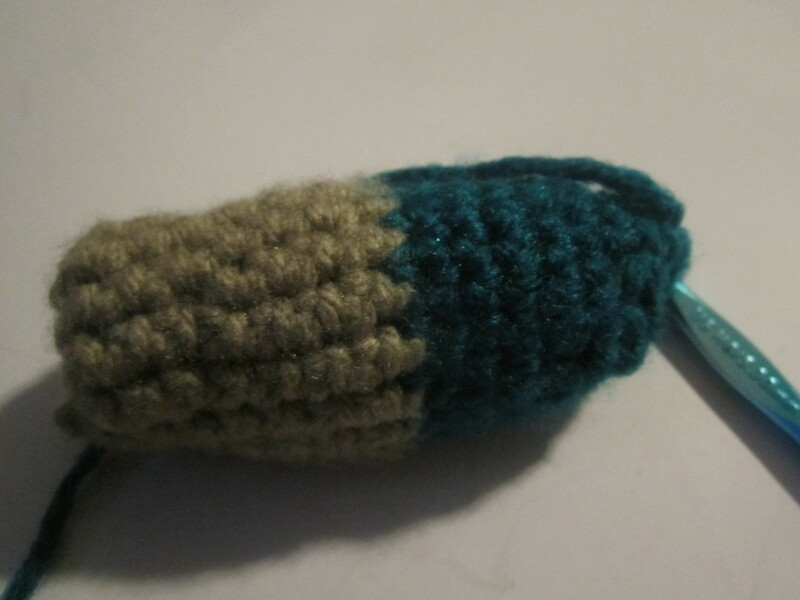 Crochet closed, then fasten off, leaving a tail for sewing on later. 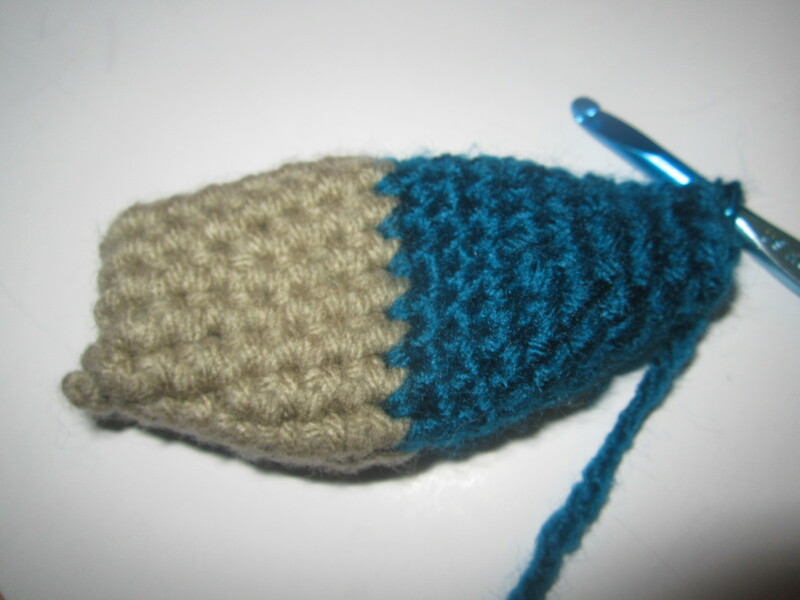 Repeat steps to make the other arm. You can add more stuffing to the neck to avoid wobbly heads. Head and Body all done! Now to add hair and face! Start by stitching your arms to your body, hide ends inside body of mermaid. Decide if you want them to be able to move forward and back or up and down. Forward and back motion makes it seem like the mermaid is giving a hug (which is why I like it), but up and down makes a swimming kind of motion. 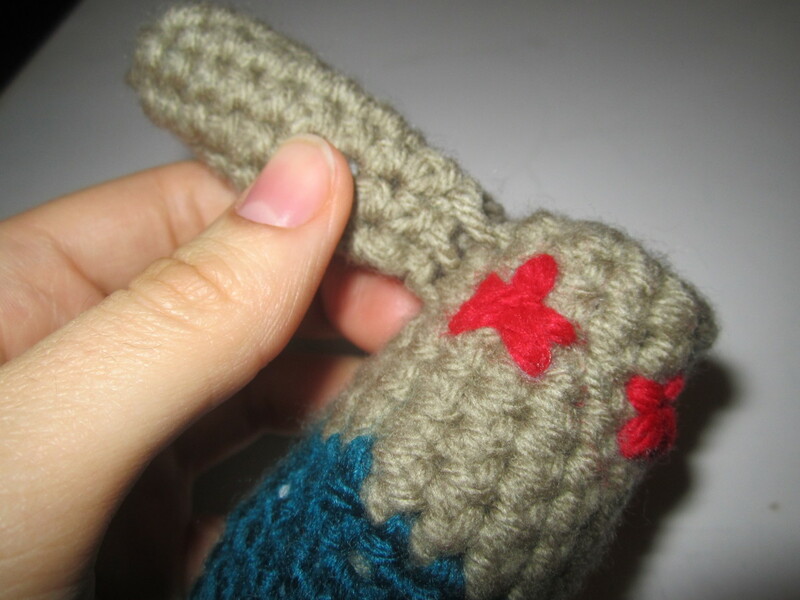 You can also opt not to sew the arms shut and stitch them on to the body so that they stick straight out. Pick the method you like best. 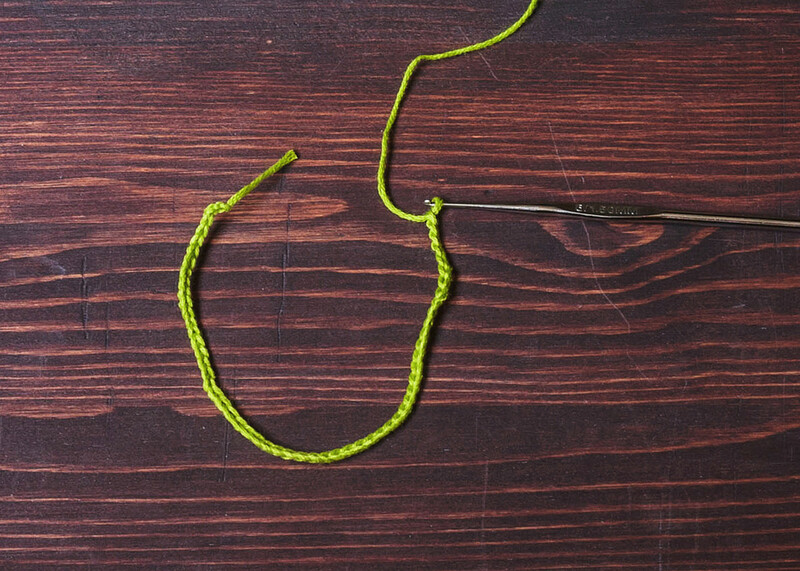 Before you sew on your head, use this time to add on any little details to the body you won't be able to include after the head is on--like a little pearl necklace or some other small necklace that wouldn't be able to fit over the head or body once it's all sewn together. The doll I was making for this tutorial is for a toddler, so I didn't add any necklaces since the little beads could be choking hazards for the necklace were to break. Sew your head to the neck of the body and secure it. Weave ends through body and trim off excess. 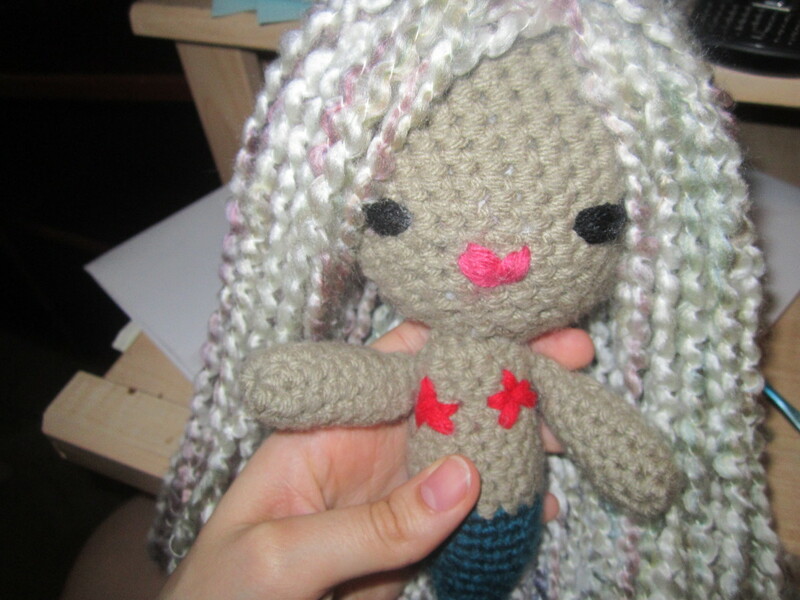 I wanted this mermaid to have a pop diva kind of look. 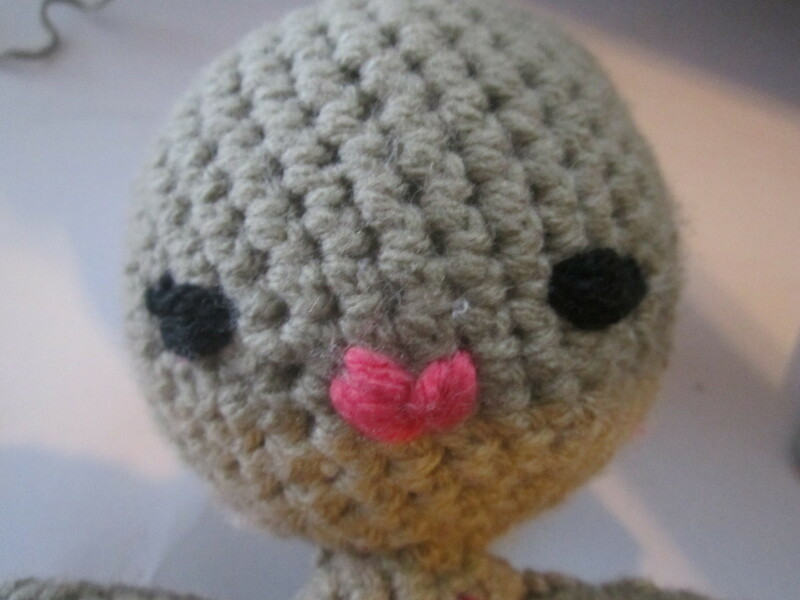 I made her lips by stitching a "V" and going over it a couple times. 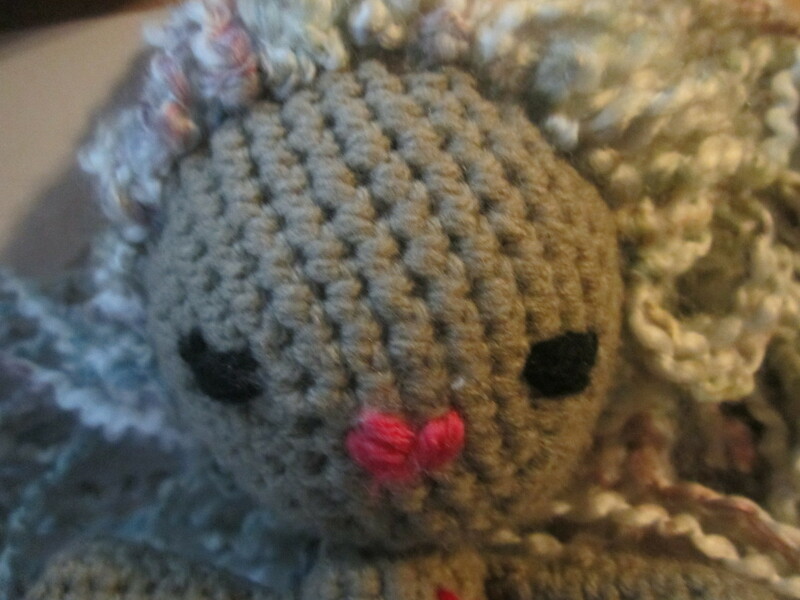 Here eyes are ovals with little "v" eyes lashes on the side. Check out this post on the fundamentals of a cute face. Plastic doll eyes are a nice simple way to add eyes to your mermaid. I don't usually use them because I often forget I have them until it's too late to put them in (Doh!) 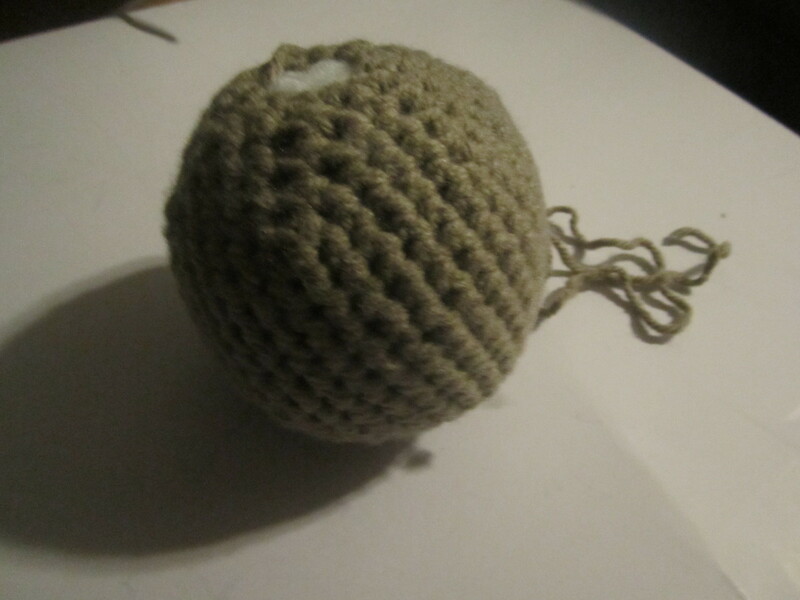 or I'm making a doll for a small child and I'm afraid that they'll somehow manage to pop them out and eat them (though I know from experience that those little buggers are near impossible to get out once they're locked in--still, kids are so clever). Beads and buttons can also be used for eyes and can be added at any stage of the design. Felt pieces can be used for eyes or details for the whole face if you like. 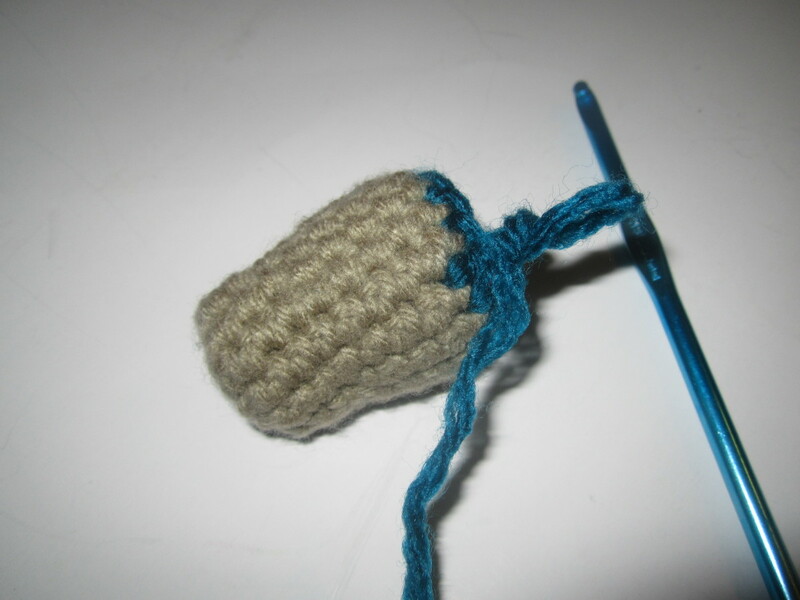 Attach by sewing on or with strong fabric glue. 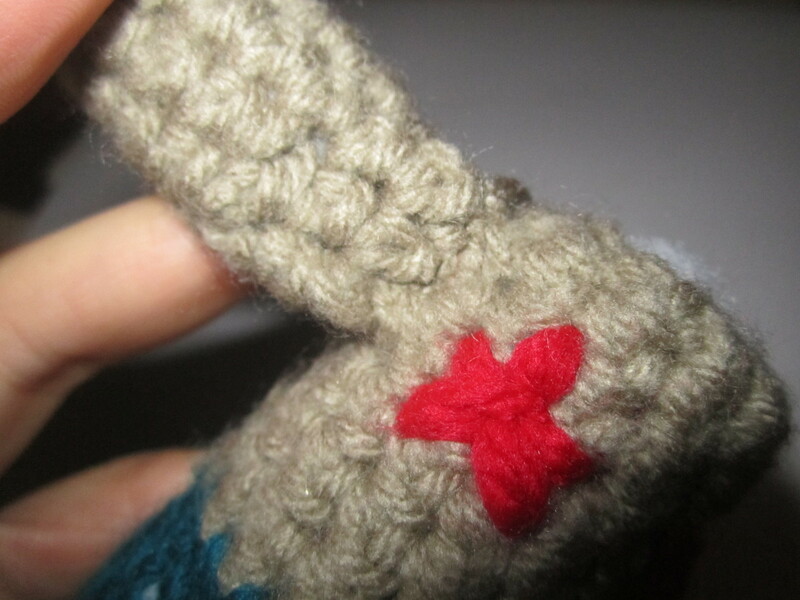 You can add even more detail by painting on to felt pieces. I will typically just stitch or embroider my facial features on. 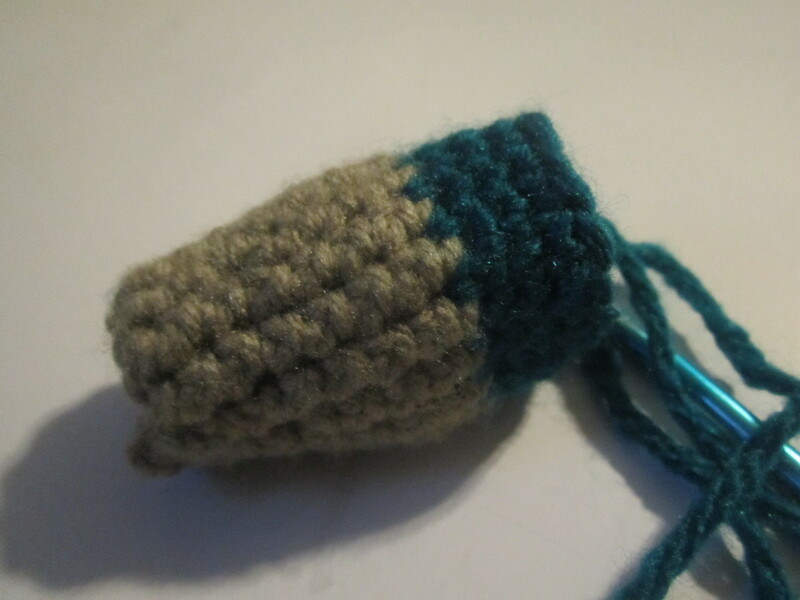 For the wig cap I crocheted Steps 1 - 12 of the Head. 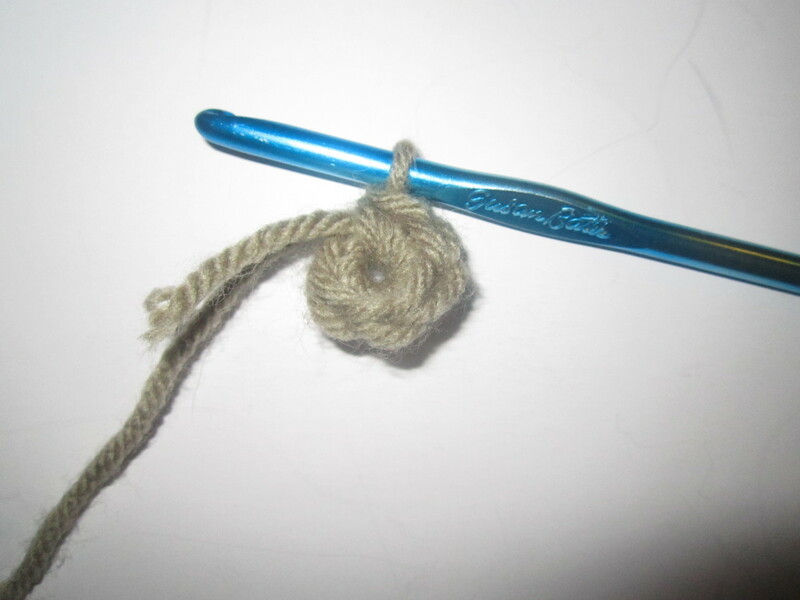 Hooking strands of yarn around base of wig cap. Fitting doll to see how it looks...so far so good. 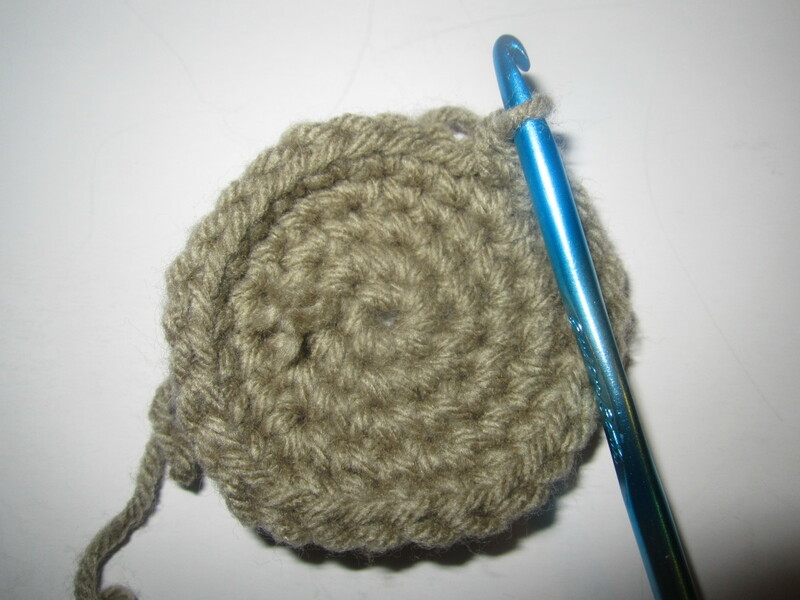 Crocheted part directly on to cap. 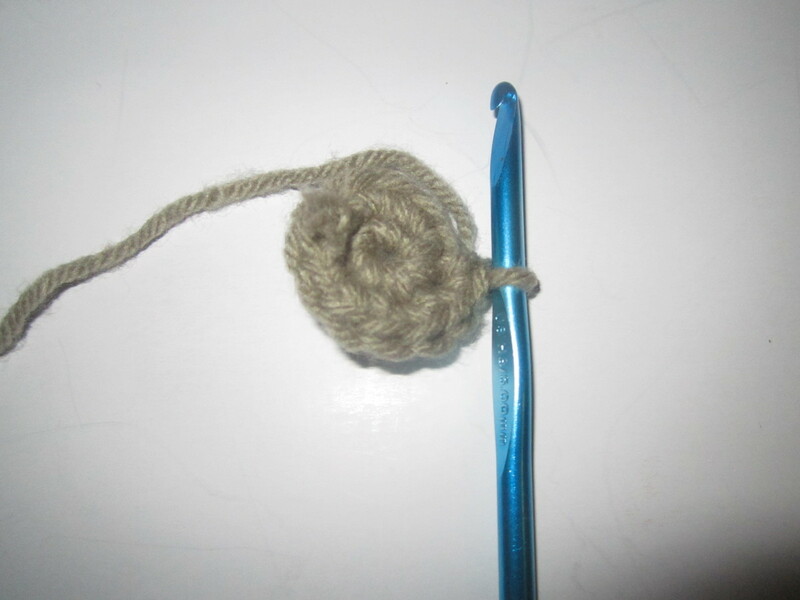 Made tail at the start and finish long enough to blend in with other strands of hair. 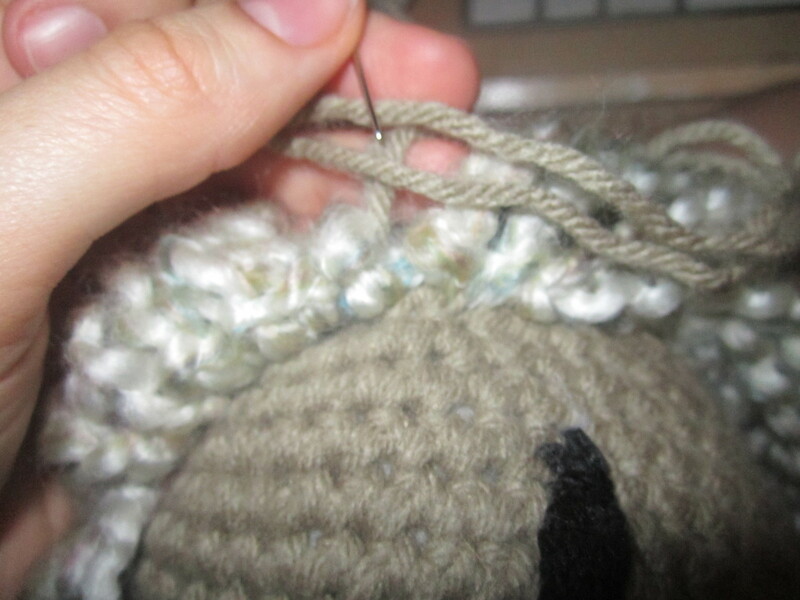 Hooked hair down either side of the stitched in the part. She kind of looks like Christina Aguilera. 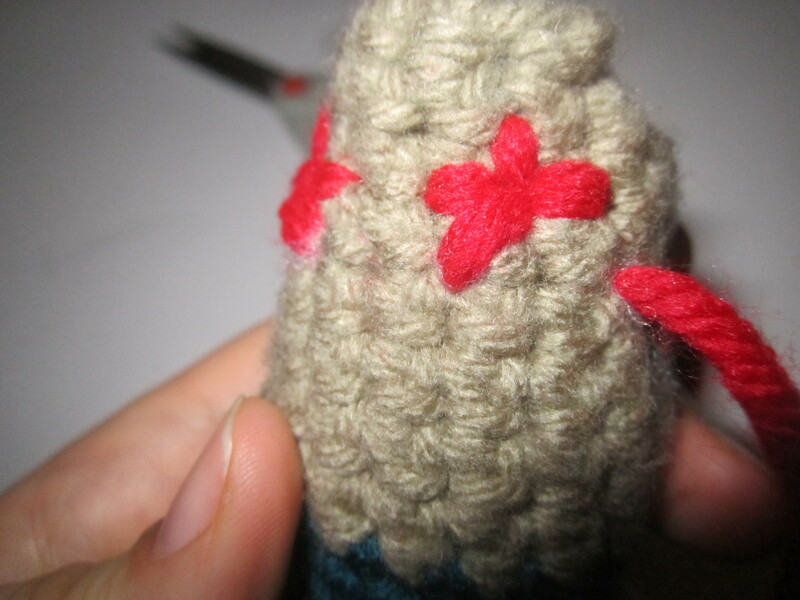 Pinned wig to doll and started sewing down edges with skintone coloured yarn. 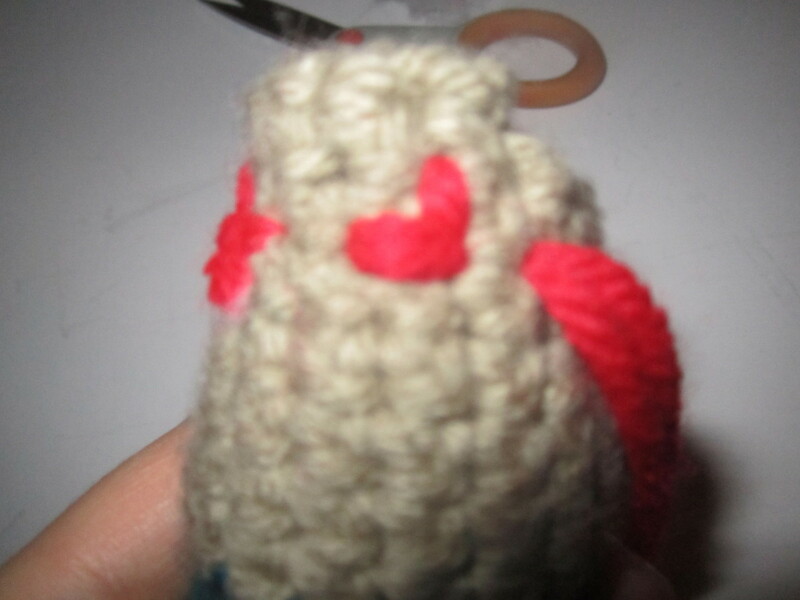 I think sewing down the hair with the skintone yarn made it really look like the hair was growing from the head! 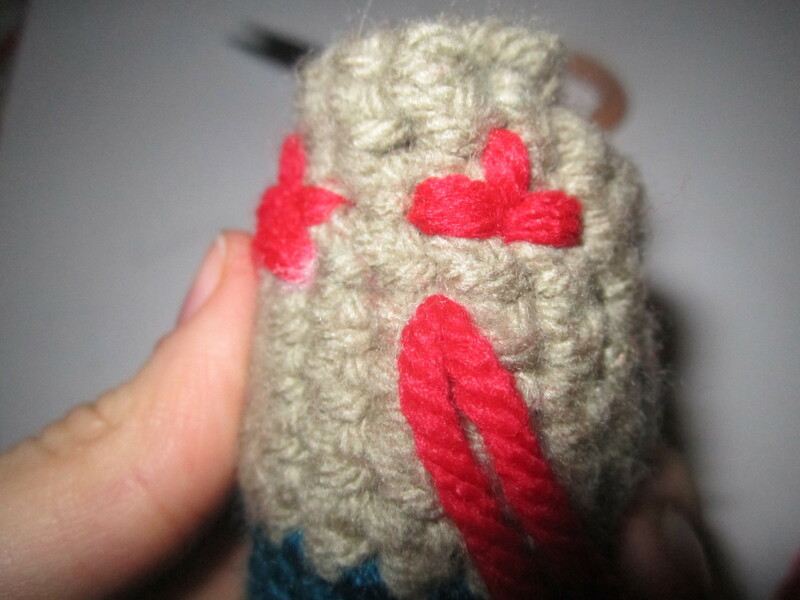 This is the part I dread the most when it comes to making dolls. I HATE making hair! It's so tedious and I get frustrated very easily. 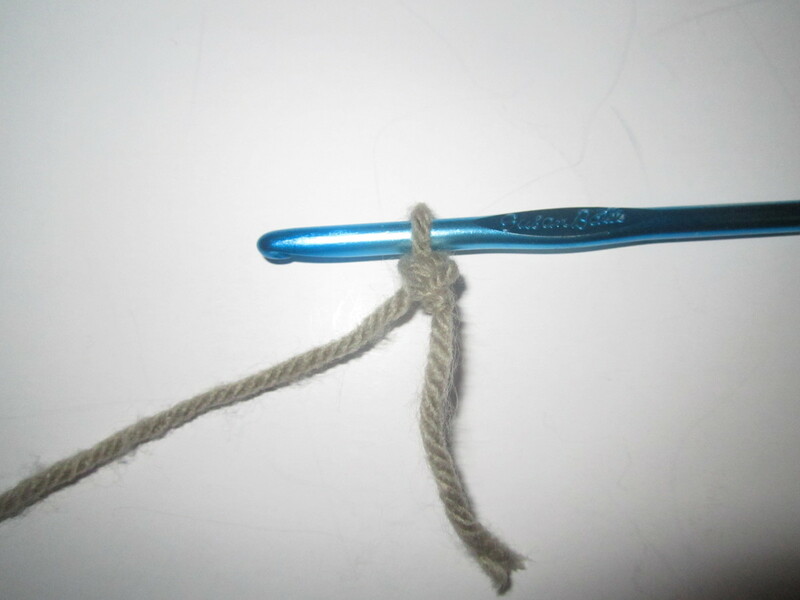 I typically use the latch hook/rooting method and hope for the best, but for this guide, I really wanted to find better ways to do it. 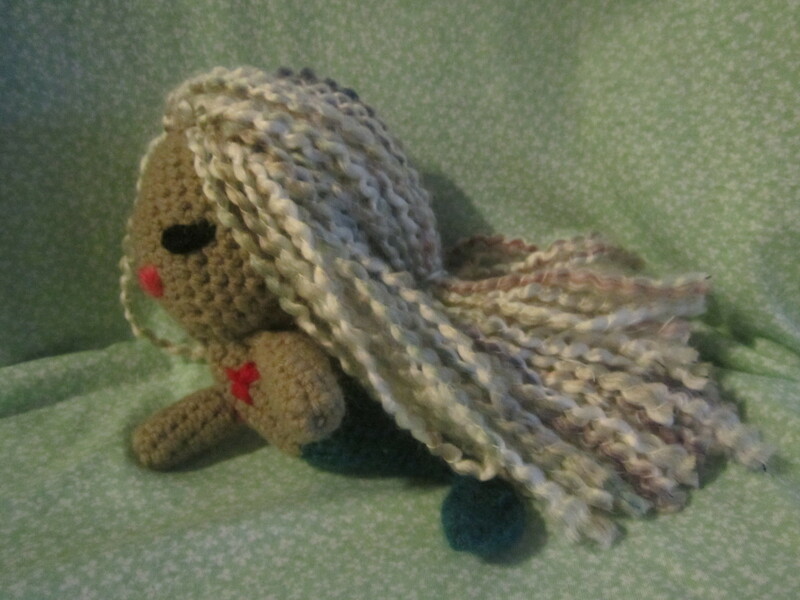 HOW TO - amigurumi hair from MyGurumi lists several different methods of adding hair to your doll using yarn. I really want to try out the curly hair method! 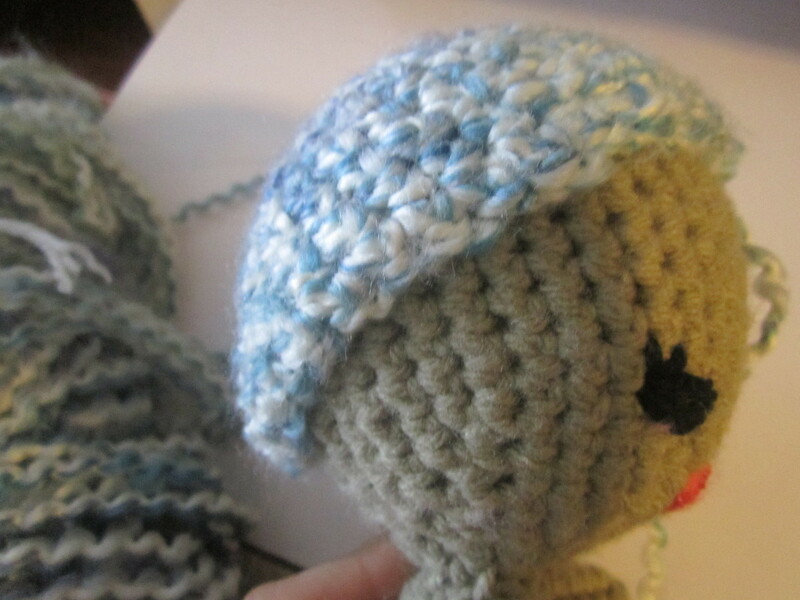 K & J Dolls has two doll hair tutorials that I really like: Part 1: Using a wig cap and Part 2: Not using a wig cap. 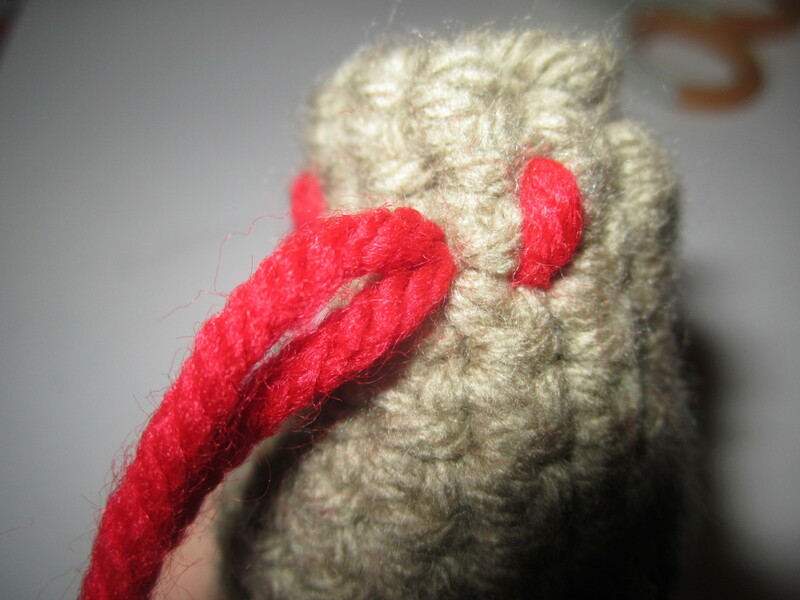 Owlishly's tutorial on amigurumi hair can really help with this. Annaboo used to have a great step-by-step photo tutorial on how to do hair, but she took it down. This is the method I used—you can see it step-by-step in the photos. 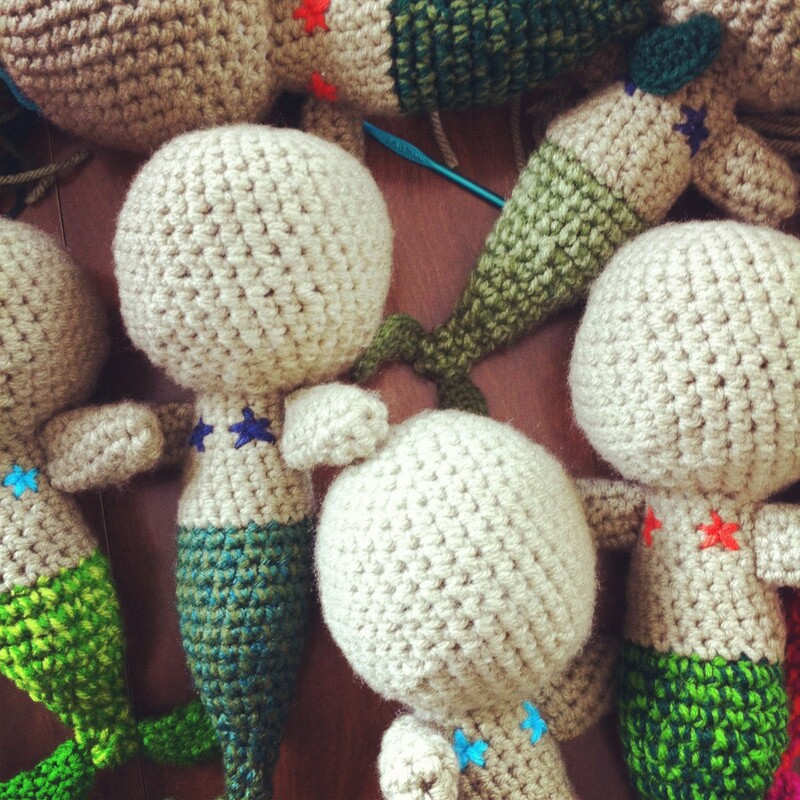 Hope you love your finished mermaids! If you have any questions, comments, suggestions, or would like to share your finished pieces, I'd love to hear from you. Just post in the comments below. 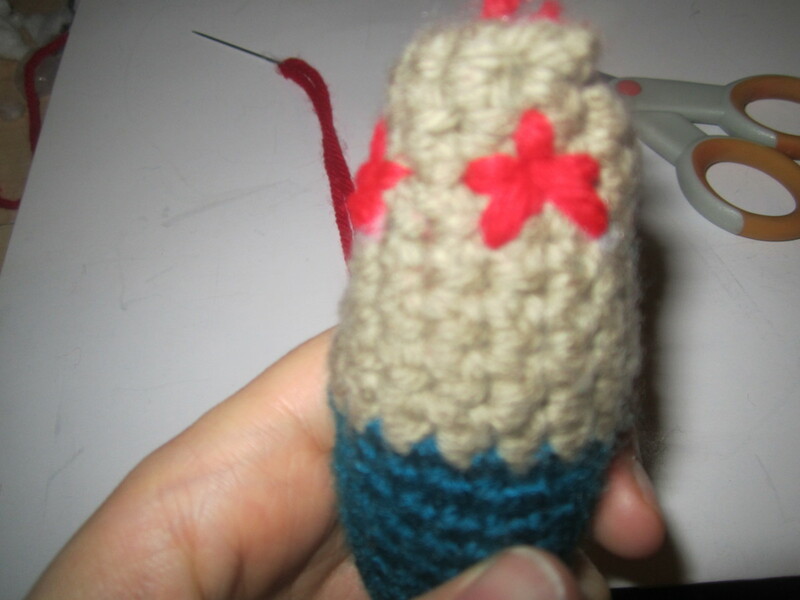 What is the approximate finished size of the doll? 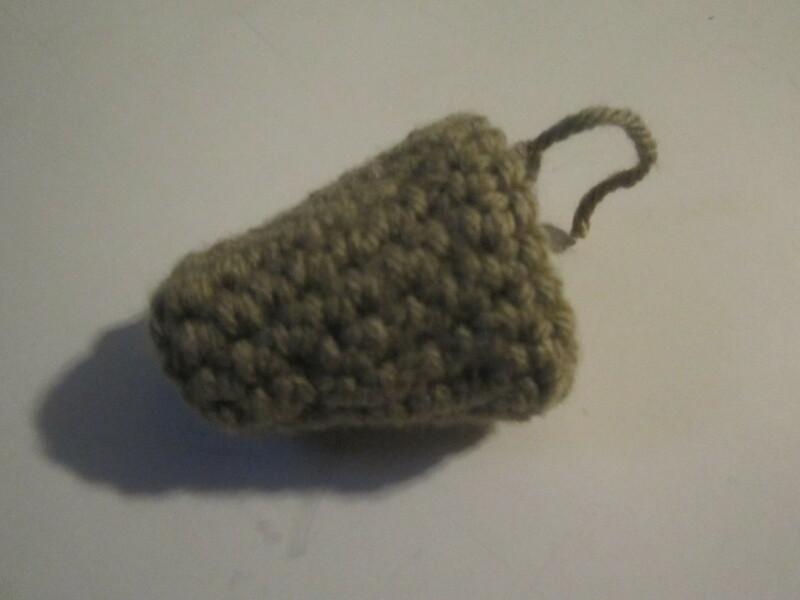 I have to edit this pattern as I've made some changes since writing this, but it should be around eight inches. I was going to ask as well about selling my creations, but you've already answered! 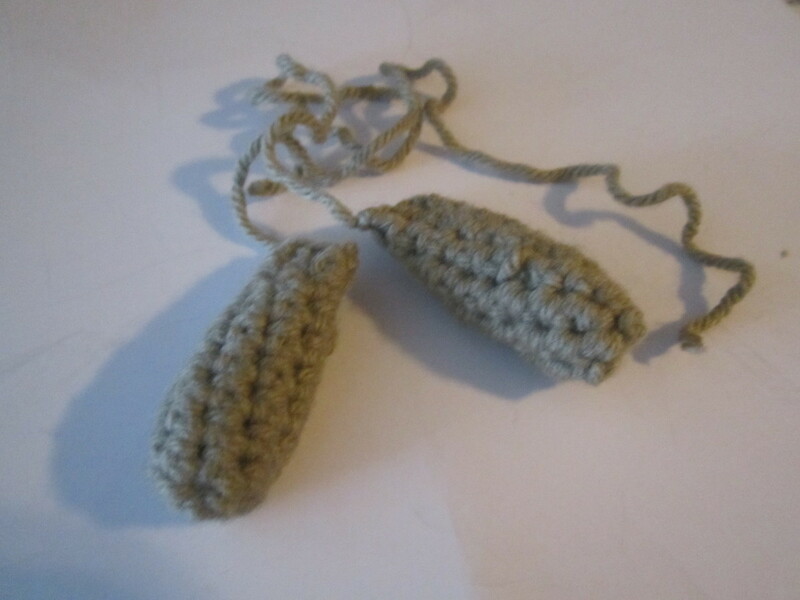 I love these so much, and it will be my first go at amigurumi so hopefully I don't mess up too terribly. I'm going to do my first one as Ariel (of course), for my little sister who loves The Little Mermaid. Thank you so much for sharing!!!! I love your pattern! 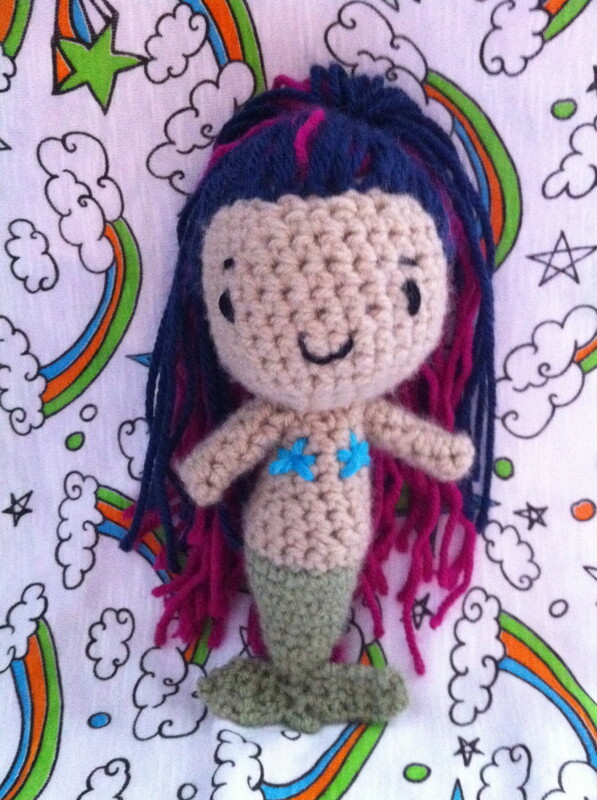 I will definitely do one for my niece!One question: What size (height) is the mermaid exactly? Great! Best of luck to you! I wish I were better at the Internet, to allow me to post photos here, but once I get the Mer-army up and going (I have all these bodies lying around, ready for assembly) I should be able to figure that out! Hi Lee, you may absolutely sell your mermaids! 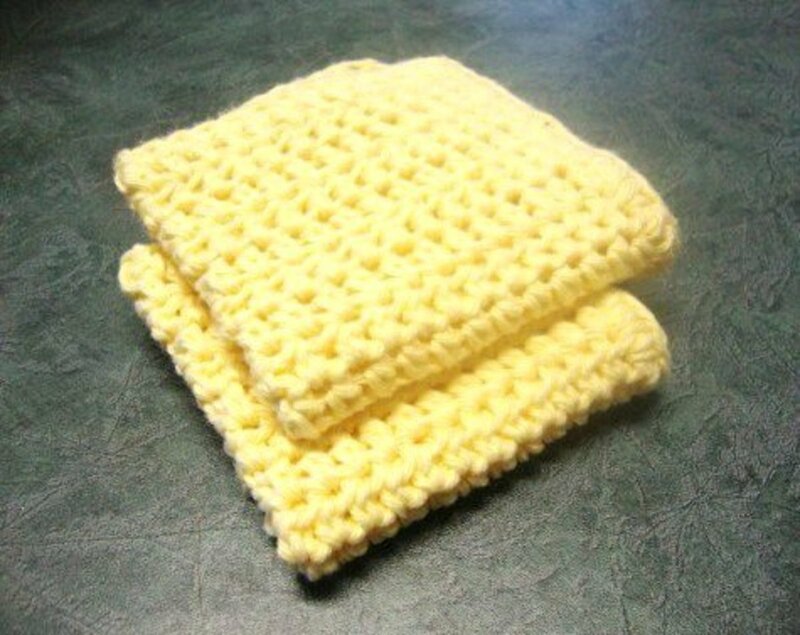 The only thing I do not want people to sell is the pattern itself. That being said, I would love to see your work! I saw this, and have to say, so many kudos to you! 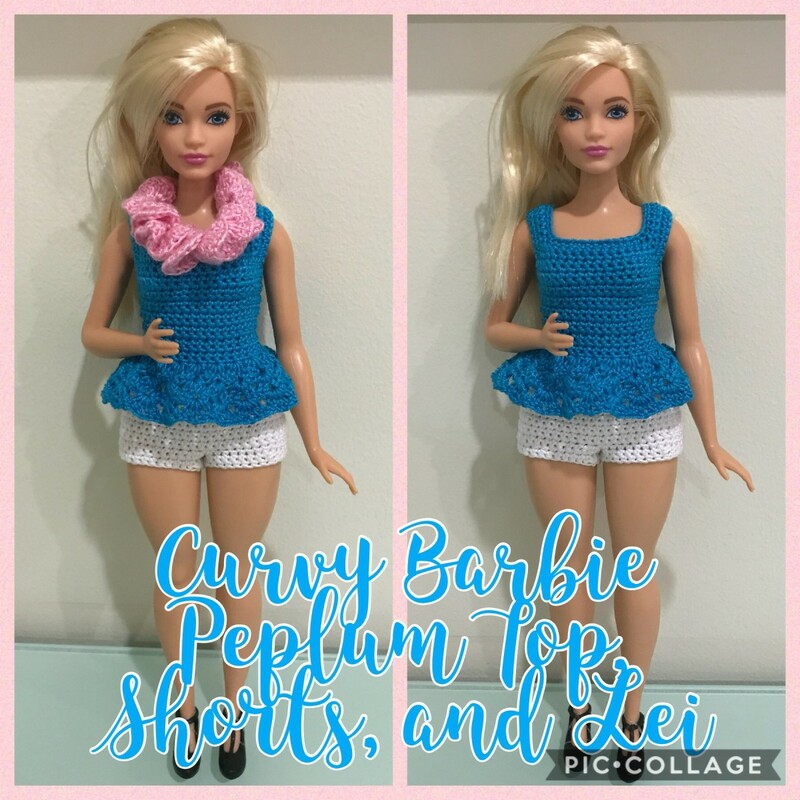 The pattern is easy to follow, the photos are very helpful, and I love that you gave advice on how to do hair! (My Achilles heel). They were fun, easy, and I had such fun doing the fins! 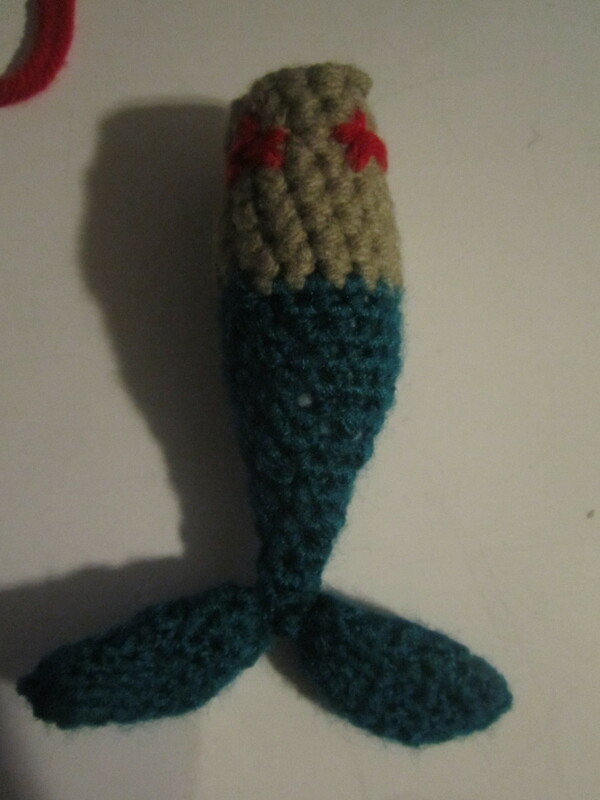 I would humbly request, may I sell mermaids based off your pattern to help me pay my way through school? They're not exactly the same (mine are a little longer, and I blow up their fins a little), but I understand completely if you don't want me to profit off of your labor. Hi Kim, it's about 10 inches long. I will be updating this project at some point and will be sure to include the dimensions at that time. How long is the finished doll? Thanks--it is so cute! I am SO happy to hear that! Good luck on your future projects! 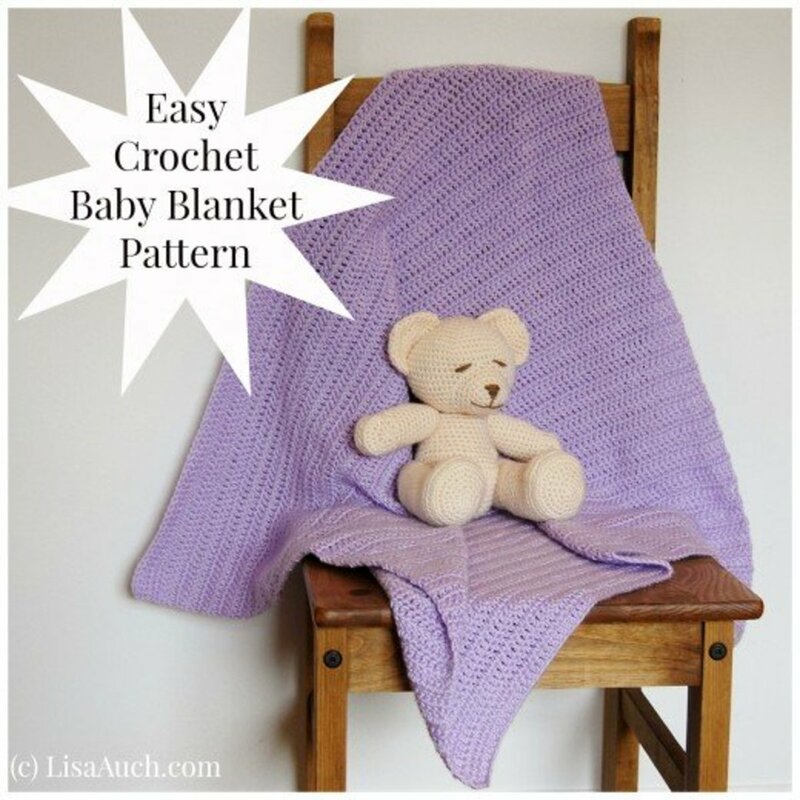 Thanks so much for this pattern! Super cute! My head turned out too big and heavy too but it's okay, she's still adorable! I love the way you did the fins and the starfish "bra". I need more practice with the hair but I love how easy it is to change up whatever you want with this pattern. Sure, sure! I would say stop increasing at either step 4 or 5, depending on how much smaller you would like it to be. 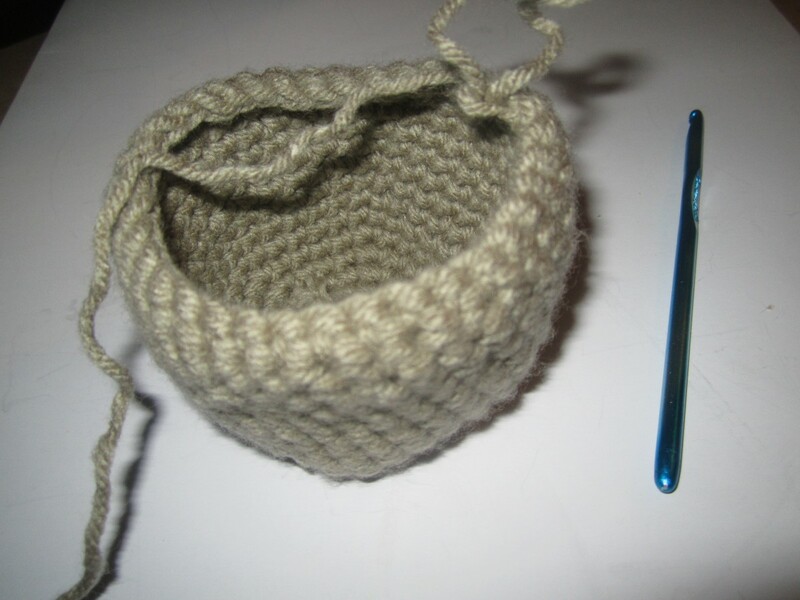 To give it a more realistic shape, I would also say add two or three more rows of single single crocheting to give the head more of an elongated shape, rather than a cute round shape. I hope that helps. 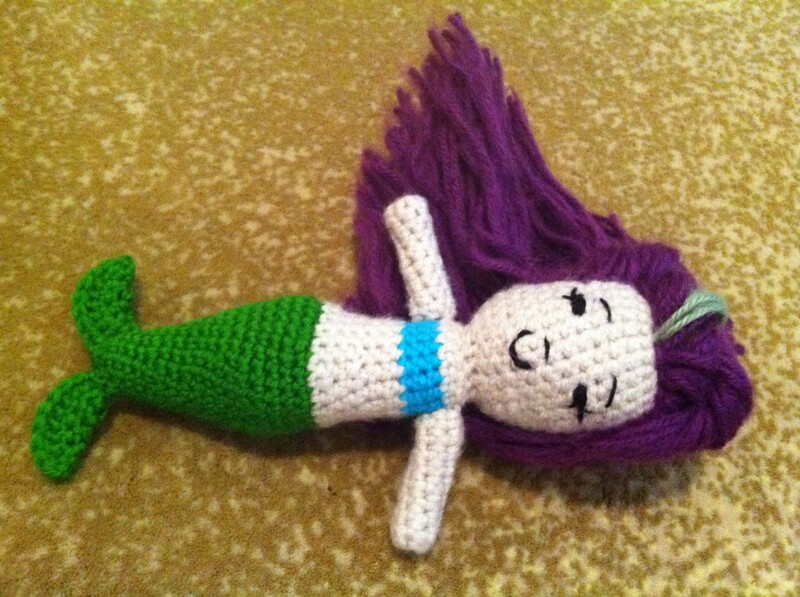 I'm currently working on more crocheted mermaid patterns to put up here. 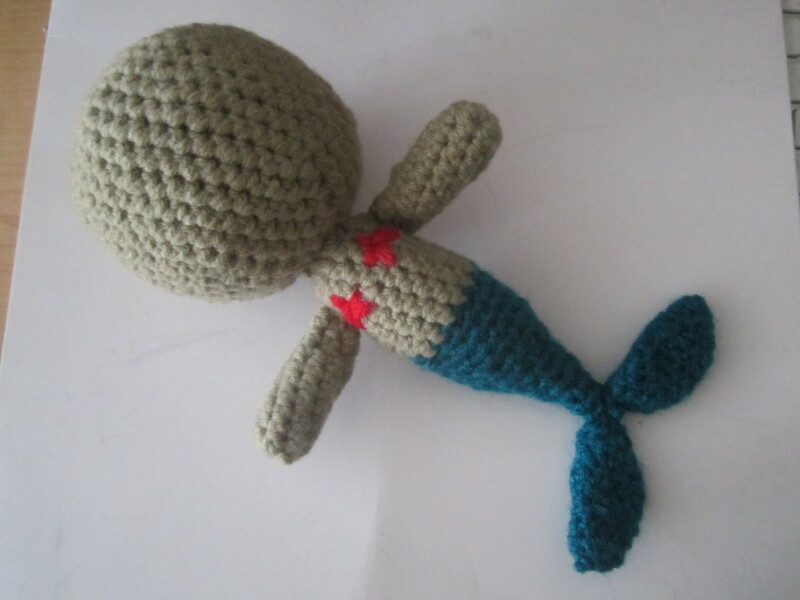 So, I will add a more proportioned, realistic mermaid doll to my list. Hopefully I can have them all up by the end of the summer. Yay! Glad to hear it! thank you! I used a 4.25 and it is looking great! Yeah you might want to use a smaller hook in that case. The stitch just won't be tight enough. Ohhh she isn't favorite too. My mom said I even wanted to name my little sister Ariel after her lol...The Little Mermaid is probably the reason I'm so obsessed with mermaids now. Wonderful! Thank you! Personally, I'd love a turtle, a giraffe and an owl. I make these on commission. If there is a particular animal, creature, or character you'd like a pattern for though you can request it and I'll make one up when I'm able. I really love this! I've been looking for specific stuffed animals to decorate my nursery and just can't find them. 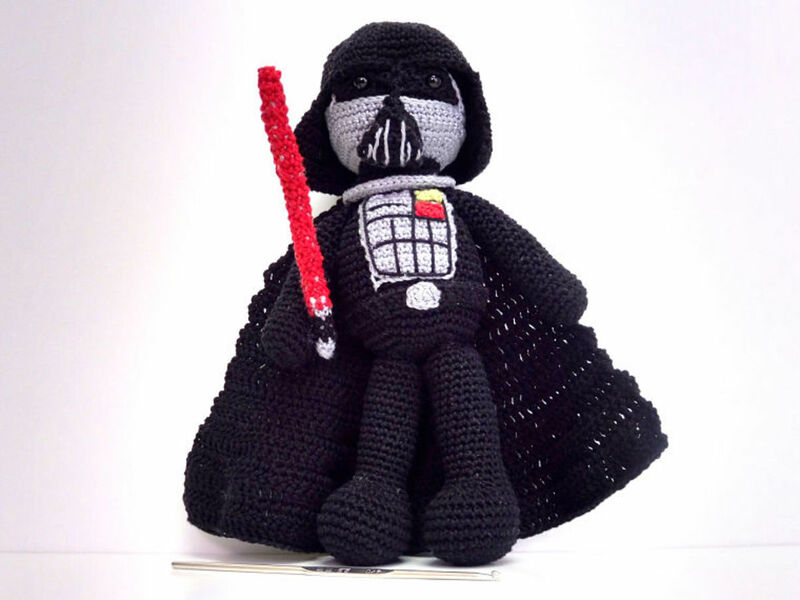 This also makes me want to learn how to crochet! Nice job! How sweet, I think my daughter (who loves mermaids) might want one out of me. This is an awesomely detailed hub! Pinning! Definitely! I haven't met a little girl yet that doesn't love them instantly. So beautiful, I may have to make two for my girls.